While Nebraska football fans can be forgiven for their optimism, deep down they know that disaster could be lurking around the corner. Coaching transitions are always difficult, and new head man Mike Riley is bringing in a new philosophy on offense and defense for Nebraska to absorb. And while a smart and particularly handsome analyst has already talked sunshine and unicorns about Nebraska’s run this year to the College Football Playoff, there’s also a scenario that goes far worse for the scarlet and cream. If the wheels come off for Nebraska this year, it could be in large part based on the challenging first three games. Riley’s career at Nebraska starts by facing a BYU team led by potential Heisman darkhorse quarterback Taysom Hill. Bruce Feldman of FOX Sports is one of many pundits highlighting Hill’s size and athleticism as a reason why he could be a star in 2015. Directional State, this ain’t, for a first game in charge for Riley and company. If the Blackshirts struggle with new defensive coordinator Mark Banker’s quarters scheme in their first live game, Nebraska could easily find itself 0-1 to start the season. Then, after a bit of a breather with South Alabama (although the Jaguars did go to a bowl game last year), Nebraska heads to south Florida to face Miami. The Hurricanes will be led by sophomore quarterback Brad Kaaya, who went 28-42 against Nebraska last year for 359 yards and two touchdowns. Miami’s talent is better than Nebraska’s, according to the 2014 rankings from CFB Matrix, suggesting the Hurricanes will have an on-field advantage. And this will be Riley’s first road game in his Nebraska career. Especially coming after an opening-game loss, it’s not at all inconceivable that Nebraska could get beaten by Miami and start the 2015 campaign 1-2. Although much has been made about Riley adapting his offense to meet his personnel, it’s hard to see how Nebraska has success on offense without quarterback Tommy Armstrong improving his completion percentage. Which is why this quote from BTN’s Tom Dienhart, after watching some fall practice, should be terrifying. After watching two practices, I have concerns. Armstrong lacks consistent touch and accuracy. He has a rep for being sharper on long passes than he is on shorter ones. Not good in Riley’s pro-style/West Coast attack. If Armstrong doesn’t progress from the career 52.9 completion percentage passer he’s been, Nebraska’s offense will struggle. And without a star like Ameer Abdullah in the backfield to bail him out, that could make Nebraska ripe for the picking as conference play unfolds. Nebraska’s two toughest conference games, Wisconsin and Michigan State, are at home. But it’s not like Nebraska has enjoyed a great deal of success against either team recently. Last year, Nebraska lost to the Spartans in East Lansing in a game that wasn’t nearly as close as the 27-22 score would indicate. Sadly, Nebraska’s 59-24 loss to Wisconsin in Madison last year wasn’t as close as that score indicated, either. So let’s say Nebraska falls to both Wisconsin and Michigan State. What else is on the schedule? Well, Minnesota holds a two-game winning streak over Nebraska, and gets NU in Minneapolis. While there are ample reasons to think Riley will make Nebraska a better matchup, history suggests the Gophers could well extend their streak to three. How about Northwestern? Other than last year’s contest, every game Nebraska has played against the Purples has been a challenge. There’s a good argument to be made that, since Nebraska’s entry into the B1G, Northwestern should have been 3-0 against the scarlet and cream going into last year’s contest. So it’s not impossible to imagine the Purples coming to Lincoln and upsetting Nebraska in Riley’s first year. And then there’s Iowa. While Nebraska fans would love nothing more than to dismiss the Hawkeyes, the fact remains that Iowa beat Nebraska last time the teams met in Memorial Stadium. And Nebraska needed a De’Mornay Pierson-El punt return (and criminally-negligent game management from Iowa head coach Kirk Ferentz) to overcome a 10-point fourth-quarter deficit and win the game in overtime. 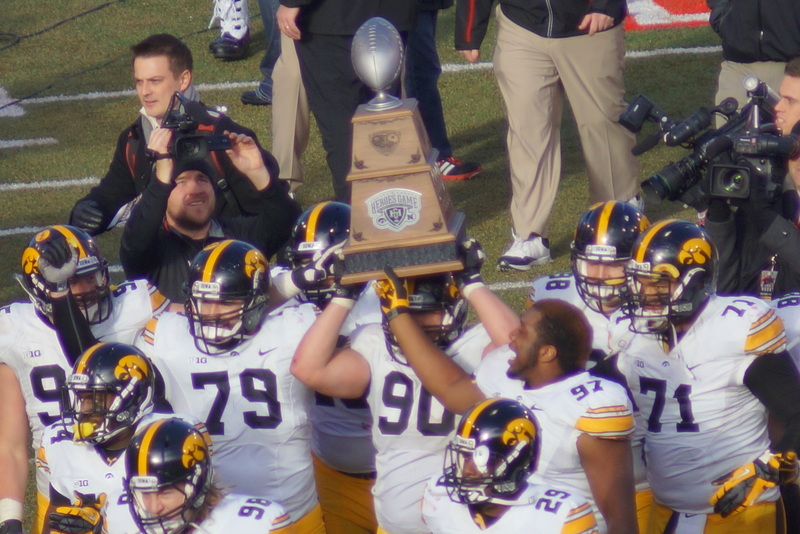 So there’s every reason to think Iowa can hang with – and ultimately beat – Nebraska at home on Black Friday in 2015. Wisconsin. Michigan State. Minnesota. Northwestern. Iowa. Sure, it’s not likely that Nebraska would lose all of those games. But it’s certainly not impossible. And if Nebraska starts dropping games, momentum could make losing more games likely. That would lead to Nebraska ending the 2015 season at 5-7, and providing disturbing flashbacks to the last time a new head coach with a West Coast offensive philosophy arrived in Lincoln. And while this dystopian view of 2015 is less likely than the rose-colored vision discussed earlier, fans should discount it at their peril. I have a great history of making bold claims about what will happen in football that routinely blow up in my face and make me look like an idiot. Before the 2011 season, I predicted the Lions would beat the Packers on Thanksgiving Day (27-15 loss), the Packers would fail to make the playoffs (15-1 regular season record), and that Philip Rivers would be revealed to be the best quarterback in the league (Spoiler alert! : He wasn’t). So I say this fully knowing it only makes this outcome more likely, but even in terms of negative outlooks this is a bit much. For one, Nebraska should in no way fear a trip to Miami. The Hurricanes are always finding new and innovative ways to outdo themselves in underachievement. Despite consistently bringing in coveted recruits, you have to go back over 10 years to the last time they won more than 9 games, and it’s been 9 years since they last won a bowl game. In four years under Golden, they’ve had one season where they were more than one game above .500. And even their record that year (2013) is pretty suspect if you look at the talent of the teams they beat (e.g. Florida, North Carolina, and Wake Forest, who they beat by a combined 12 points) against the teams they lost to (Virginia Tech and Duke beat them by 18 each, Louisville by 27). We may not yet know what we have in Riley’s hire, but we definitely know what the Hurricanes got by keeping Golden around: A very talented team that will still completely underwhelm you. If Riley’s reputation (that is, that he elevates his players and gets them to perform above their skill level) is deserved, I’d say that should easily negate any talent advantage Miami might have. As for Northwestern, they don’t scare me either, because frankly, none of our games against them should ever have been as close as they were. But the one thing that was consistent about Pelini’s teams was inconsistency, in this case in regards to their preparation for the game. Had they come into those games well-prepared, we probably would have seen three games that looked a lot like the second half of our tilt with them last year. Now again, we’ll have to wait and see what we’ve really got with Riley, but his rep claims that he prepares his players well and, as you’ve pointed out in the past, that does seem to be the case so far. Unless we’re shown otherwise, we ought to look at this as a relatively confident win. Finally, as for Iowa, “criminally-negligent game management” is basically Ferentz’s game plan at this point. If you need proof, look no further than their last two match-ups with Iowa State. Two years ago, the Hawkeyes led 27-7 with 7 minutes left, then had to recover an onside kick *and* put together a successful defensive stand to prevent the Cyclones from stealing it. Last year was even worse, with Ferentz essentially giving Iowa State two attempts to win on a last-second field goal by calling timeout after the first attempt, which missed. The second one did not. Oh, and Iowa is without their starting quarterback of the past two years. So there’s that. I would agree in many ways with you. I think the worst-case scenario is far less likely than my best-case scenario, and that one has Nebraska making the Playoff. I agree with just about every observation — Golden has amazingly under-performed, and Ferentz’s continued employment in Iowa City is explained only by a paralyzing complacency in the Hawkeye fanbase that tolerates the dross put on the field in the last few years. I would dissent somewhat with regards to Northwestern. Never mind the fact that Nebraska should have been 0-3 against the Purples going into last season’s game. I think Fitzgerald is a pretty good coach (not great, but above average), and I think the money that’s been (finally) invested in the program has the potential to pay dividends. Northwestern isn’t quite what Missouri was in terms of sleeping-giant potential — Illinois wins that, hands down — but as long as the Illini program is going to lay fallow, the possibility is there for Northwestern to over-perform. I guess the point I was trying to make is that all of those games COULD go wrong for Nebraska. Be honest, if you look at each one individually, you wouldn’t be stunned if Nebraska came up on the wrong end. So if all of them individually could be lost, then there is some collection of circumstances where they ALL go wrong. That puts Nebraska at 5-7, and sets up what might be the most interesting (and insufferable) offseason in Nebraska history. Honestly, I’d be stunned if this scenario even comes close. I was a huge Riley guy even before he showed up in Lincoln. I really do think people are under-valuing how hard it was to win they way he did in Corvallis. And I think his attitude combined with his experience (and I would probably rank them in inverse order of importance) should sail Nebraska through choppy waters during the transition. But I thought this was a valuable exercise, if nothing else than to dampen any irrational exuberance. I honestly don’t sense much of that, but I’m sure it’s out there. Plus, dirty little writers’ secret. Writing two pieces like this gives you the chance to link back to them and look smart if either comes close. Thanks again for the read and the thoughtful comment! *Gasp* that’s brilliant! Why didn’t I think of that? I see there is much I can learn from you. Thanks for your reply! I hope that you enjoy our interactions nearly as much as I do. I have no idea if it’s annoying or just tolerable to have someone constantly telling you that you’re wrong, but I do enjoy reading your blog and your responses to my comments! The one thing I feel I should clarify from my earlier statements is that I meant no disrespect to Fitzgerald. I think the man is a very good football coach, and I would argue that the main reason those first three games were so close is because he outcoached Pelini. I think our game with them this year is a relatively confident win because I don’t expect him to outcoach Riley. Although I had not heard of their new investments in their football program–I’m guessing that’s a recent development? But the simple fact is they have been bad the past two years. And yeah, you can blame that on injuries and on transfers, but if those events can completely derail your season, your depth was pretty awful to begin with. It’s going to take them a while to rebuild their momentum after the last two seasons.